Even though the nose suggests sweetness, this is a very dry wine. It's very elegant - unlike some Großes Gewäches - its dryness and mineral drenched backbone tempered by hints of sweetness on the finish. It's complex on both nose and palate, where the clean fruit complemented by minerals and dill. It was obliviously German. Nahe to me was also an obvious call - the marriage of elegance and dryness is very much in the Nahe style, even though I suspect that the "Nahe style" is really the style of three-four producers. Once we got that far, the playing field narrowed down, because we all buy from the same places and we all know what Nahe producers are available locally. It just didn't seem like a Donnhoff. Donnhoff's dry wines are much rougher and grainier than this and, to be honest, somewhat less fine. So we narrowed it down to Schafer-Frolich and Emrich-Schonleber and took random shots at the year. A decent round. When I tested it at the start of the evening, it was very murky, all rotting forest floor leaves and old wood. By the time we got to it an hour or so later, it had emerged to show sweet cherries, the rot and mud transformed into iron and wet earth. 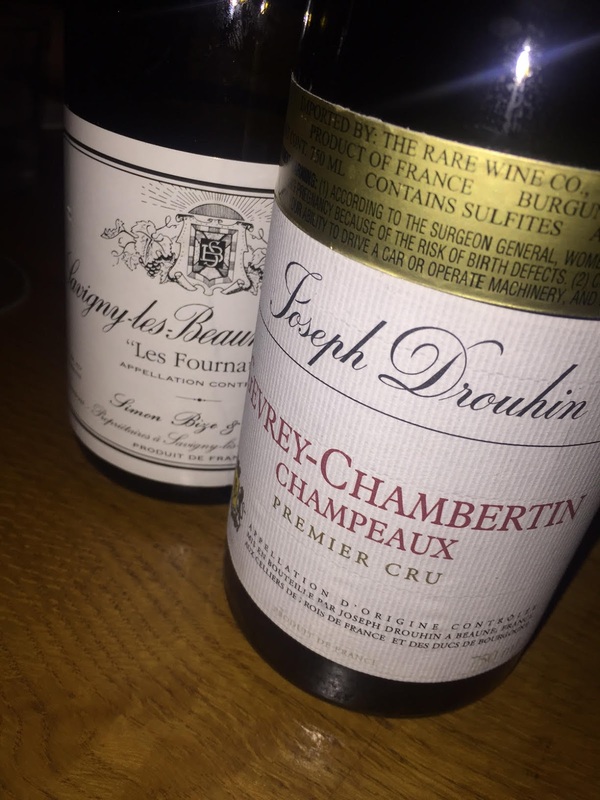 In Burgundy, you have the bad stuff, the good stuff, the really good stuff and at the top, the glorious, moving bottles of juice spearheaded by the expensive unicorns you just can't afford. This edges into the "really good stuff" category that is where the Bourgogne freaks would love to live every day. It has excellent balance and finesse, although, to be honest, it is just a tad foursquare. This was my wine and I knew that only a real die-hard would guess the village. Everyone got Cote de Beaune and said it was not from Beaune itself. Which was a good direction because this really is a cross between the finesse of Volnay and muscular Pommard. This is obviously a warm, New World wine. Wait, it wasn't obvious at the start. It was a struggle to decide between a modern winemaker from warm, Old World country and a New World wine outright. I guessed south France because the depth and fullness of the fruit suggested, to me, a cross between Cahors and a less tannic Madiran. I was just following wild impressions and wild guesses. The difficulty was that the wine itself eludes obvious categorizations. Basically, it has sweet fruit that is structured as well - and that combination is always hard to peg down - with notes of iron, brine and spices. Once its origin was revealed, I guessed the year based on my assumptions on how a local red of this style might age. It was a convoluted guess, though. Assuming an age-worthy style, anything post 2010 would have just felt too young. 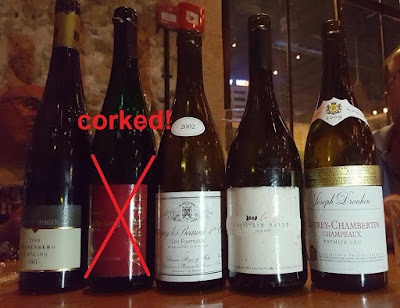 It had to be something older, but I don't think a lot of winemakers in the last decade managed to get that much fullness; a lot of wines were a blend of ripe and green. So there was really a limited period when someone could have made a wine of this style, and arguably less than five who actually did. During this round of the guessing game, I was the last one to succumb to the idea that this is a Bourgogne. Once I bought into that, Gevrey was a good choice. I didn't guess the year, I got Drouhin after going through a couple of Gevrey names. A bad round for me, but a truly excellent wine, very much in the Gevrey style, floral and earthy, black fruit driven by soft tannins with fresh acidity that is quite surprising given the year. Will easily age for another decade.